Morocco desert trips for private & small group from Marrakech or Fes..
Morocco desert trips take you over dunes, and through nomadic villages to discover yourself in the tranquillity of the Sahara, breathe the fresh air of the oases, explore mystical Berber villages, and lose yourself in fascination with each casbah as you let the spectacular gorges and serene dunes become backdrops for your memories of Morocco. 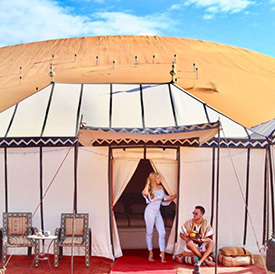 Your amazing journey into the desert begins with a welcome by your private driver upon your arrival at Marrakech, an ancient city of weathered pink buildings and orange groves at the base of the Atlas Mountains. Spend the afternoon exploring fascinating local souks (markets), palaces, and gardens. See the Djemaa el-Fna, a carnivalesque public square where water sellers, snake charmers, magicians, and storytellers compete for an audience. The next day, depart by private transport via the breathtaking snow-capped peaks of the Atlas Mountains, the largest mountain chain in Africa that divides the fertile coastal regions from the desert interior. Stop en route at Ait Ben Haddou, Morocco’s largest and most famous casbah. Overnight in Ouarzazate, a thriving trading post and Morocco’s modern-day Hollywood. Continue your journey through the magical and fertile Drâa Valley with its casbahs, Berber villages, date palms, olive and almond groves. 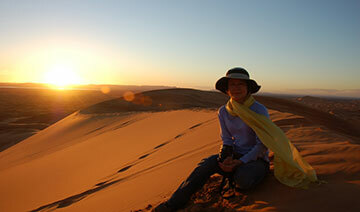 Your first glimpse of the Sahara is the sandy dunes of Tinfou. 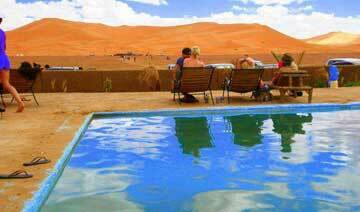 Overnight in Zagora, a stop on the ancient camel caravan route marking 52 more days to Timbuktu. Then head toward central Morocco, travelling past rich river valleys, dramatic escarpments, plunging ravines, and palm-filled gorges. Overnight in the desert outpost of Erfoud, where you may purchase your headscarf alá Laurence of Arabia in anticipation of the next day’s desert journey. 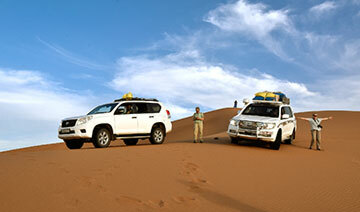 Nearby Merzouga is the point of departure for Morocco desert tours and Sahara immersion. 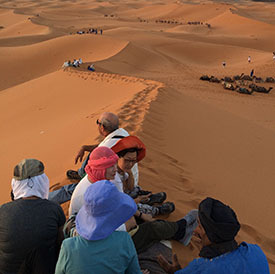 Explore the mystical landscape as you ride on camelback, led by a Bedouin guide robed in the flowing blue garb of the Tuareg people, through the stunning sands. 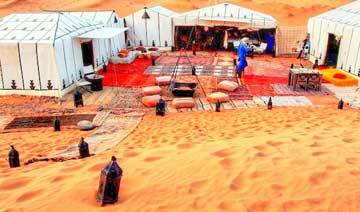 As night falls, delight in a Moroccan feast cooked in the elements. 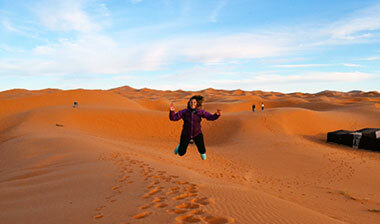 After dinner, climb to a high dune to appreciate the vastness of the desert and lights flickering from nomad encampments. 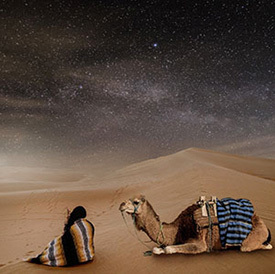 Sleep in a nomad tent beneath the innumerable stars of the clear desert sky. Experience a sense of timelessness as you dream of the Little Prince or caravans of old. Awake with the sunrise to watch the colours of the desert change before your eyes. Return to Ouarzazate through the Dadès Valley and its Road of a Thousand Kasbahs that rise up like turreted sand castles along this ancient caravan trading route. Stop in the Todra Gorge to marvel at the natural force that carved this quiet Berber oasis and rock-climbing haven. 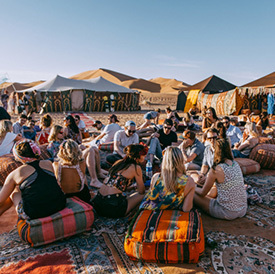 Cross Tizi n’Tichka en route to Marrakesh for relaxation in lush gardens, shopping in the souks or soaking in a traditional hammam (steam bath), a bit of luxury to end your journey.